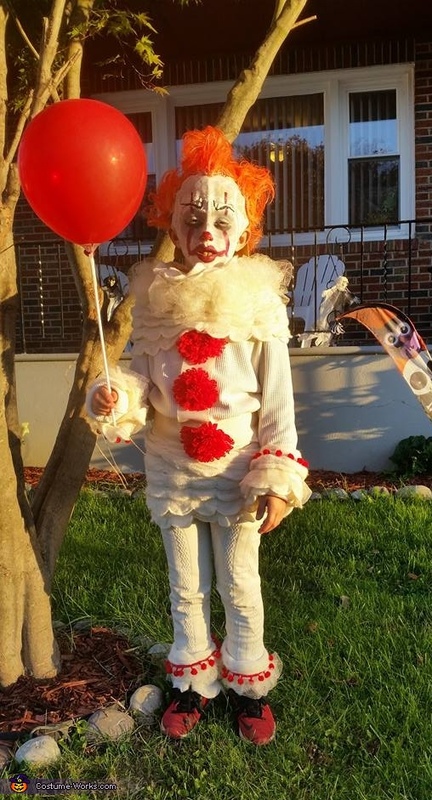 My son Angelo loved the idea of being Pennywise the Dancing Clown from Stephen King's It. We loved his old flick, and even saw the new one twice in the theatre. I also have done Twisty the Clown for my other son Nicholas in the past. In general, i have always been a huge fan of horror, and I guess you can say the apple does not fall far! I am not very savy with a needle and thread, so i made this entire costume using mostly safety pins,hot glue and velcro. I used a long john shirt, girls textured leggings, and 3 scarves from Five Below (all cream color). Netting fabric, wide ribbon for the belt, 3 red poofy things from the dollar store , and the little red ball ribbon from michael's. I bunched up the netting and pinned it for the puffy collar and also around the leg and wrist bands, along with the scarf, which i cut to fit and then hot glued the red ball ribbon around. I also purchased a bald cap and a long hair orange wig. i cut the wig and glued it to the cap in the length and shape i wanted. Then i teased it up using Elmers glue and a hairdryer!! It was so much fun to make, and my son was pretty patient for the time he had to stand still while i cut, glued, sprayed, and pinned!!!! And the makeup was white, black, gray cream makeup, red lipsticks, and black eyeliner. And of course, the balloon!The reactions were super-amazing!!! Angelo was a total celebrity in this costume! Everyone we passed shouted different things in excitement, and some with fear!! All night we heard, "IT", "It's Pennywise!" "Jesus Christ look at this clown!" "OMG"'s I don't think we passed anyone who we didn't scare or get noticed by, and so many compliments on the makeup and just the whole costume in general! !It felt really awesome to make this costume for my son, who is 9 years old, and very happy to give the spooks and creeps to all!!!! Great costume. Thought it was store bought. Heard it was homemade by a dear friend who made it. How do we vote for this costume? So creative on the part of the Designer and the Actor! I saw great amateur photography finding him in many places acting out in Character originality! This little dude is going places! Maybe mom too!